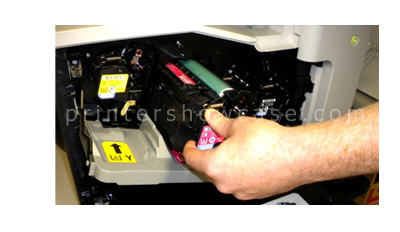 In Short: The HP Color LaserJet M750 series is Hewlett Packard’s tabloid color laser printer for the small office and geared towards lower volume use. The M750 printer setup is simple and does not take long at all. Most of the supplies including the four toner-drum units and waste load from front of the machine. It basically looks like a bigger version of a CP4025. 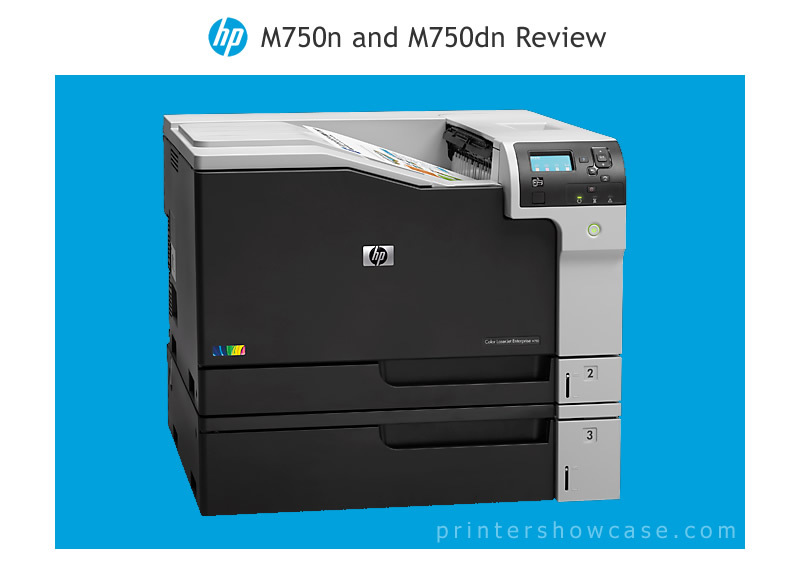 The HP M750 is rated at up to 30ppm in color or mono making it the slowest of this group of printers. Our overall impression is that the M750 may not be as robust, or a machine well suited for heavy use. The throughput of the printer in our testing was below average for this price range, especially when using the auto duplex printing feature, (only available on the M750dn models). The color LaserJet M750 has a maximum resolution of 600dpi; again the lowest resolution of this group of printers. However the 600dpi is more than adequate for B&W text and most all office documents use. This printer also gets good marks for color accuracy out of the box. The 600dpi limitation does show up when printing high resolution documents with small details. Light gradients and solid light colors in general look especially grainy or dithered. 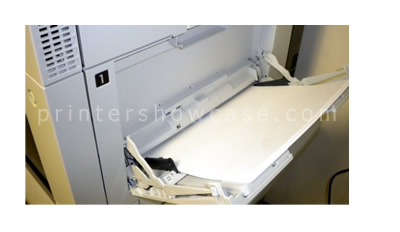 Standard on all the M750 models are two paper trays which is a plus, even though the top one only holds 250 sheets. The 300-sheet output capacity and max paper weight of 220g/m2, (only through the MP tray 1), are the biggest paper handling drawbacks. All configurations include fast Ethernet, PCL, PostScript3 emulation, and 1GB of RAM. The M750dn model includes auto-duplex and the M750xh configuration includes the three additional trays, floor stand, and an internal hard drive. The Bottom Line: The Hewlett Packard M750 series is an 11x17 capable color laser printer for the small office. It produces color print quality adequate for most office documents and is best suited for low volume environments printing on plain paper. Overall it’s not a bad printer, but it does have the lowest resolution and slowest print times of the other printers we tested in this price range. We would not recommend the M750 for applications that require high resolution image printing or where printing on heavy media would be required. The M750 works well with most all versions of Windows and most recent Mac OS versions.